Get ready to play the funniest game around! These Dad Jokes are so embarrassingly bad that you will most likely roll your eyes - but, as hard as you try, can you stop yourself from laughing or even cracking a smile? Two players sit face-to-face and take turns telling a joke. Read a Dad Joke off of the card and do so WITHOUT SMILING OR LAUGHING, while trying to get your opponent to crack. When a player smiles or laughs, their opponent gets a "Made You Laugh" card equaling 1 point. The player with the most points wins the round, and the one with the most rounds wins the game! 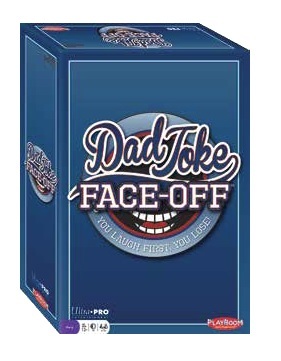 Continue to Face-Off with other opponents to see who has the best (or worst) sense of humor!